When most people think about taking care of pets in the cold, winter months, they usually think about cats and dogs or horses, rabbits and other primarily outdoor animals. However, it is also important to think about taking extra special care regarding the cold weather when you have small rodents as pets. Hamsters, guinea pigs, gerbils, mice, rats and other smaller rodents need to stay warm in order to remain healthy through the cold season. 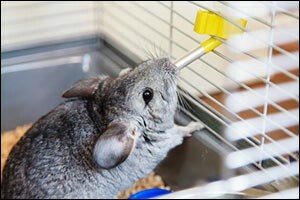 In fact, it only takes a drop to 50-degrees and it can quickly become very dangerous for your small pet. Small pets that are very young or very old are also at a greater risk of developing bacterial or viral infections when it is cold because the temperature can affect their immune systems. Additionally, hypothermia is a real threat to small pets who have limited access to warm areas to protect themselves from the cold. Most people who have small rodents as pets know how to create a proper habitat according to the needs and requirements of the specific type of pet that they have. For example, guinea pig care and feeding is similar, yet very different, from what is required to keep a pet mouse. Small pets should be kept indoors during the colder months, even if they stay in outdoor hutches in the spring and summer. Add more bedding, warmer types of bedding and change it out more frequently. Create a place for your pet to play indoors when the temperatures drop below 50 degrees. For specific guidelines regarding the type of pet that you have, speak with a vet at Anchor Animal Hospital Dartmouth. Unlike reptiles and amphibians that require an in-tank or in-enclosure heat source year-round, you will need to think about how to safely improve the temperature for your small rodents as pets. Winter tips for small pets that live in cages includes keeping them in a room where they won’t be exposed to outdoor drafts from windows, doors or areas of the home that are not insulated or heated. If the room is at a comfortable temperature for you – and is above 50-degrees – chances are it will be just fine for your pet. Consider covering your pet’s cage or enclosure with a blanket at night for extra protection from drafts or chills. In addition to improving or increasing the amount of bedding that you provide to your small rodents as pets, the veterinarians at Anchor Animal Hospital Dartmouth recommend that you also consider adding extra containers for nesting. Nest boxes that are made out of thick plastics, wood or ceramic, as long as the pet doesn’t chew or gnaw on them, can provide a well-insulated place for your pet to sleep at night. Make sure the nesting containers cannot be overturned by your pet or that it won’t tip and fall on them, harming them in the process. Depending on the type of pet that you have, consider adding paper towels, toilet tissue, facial tissue or even small scraps of fleece for the animal to use to warm up its nesting area. Again, make sure the pet isn’t chewing or eating the material. Larger small pets, such as rabbits, ferret and guinea pigs will also enjoy small cat beds to snuggle up in to sleep. If the area where you keep your small rodents as pets is not warm enough or cannot be warmed up enough to get to that 50-degree threshold, consider adding an extra heat source to the room. Portable space heaters can be good, but it is important to make sure that you don’t put them right next to the pet’s cage. Check guidelines for guinea pig care and feeding, or heating and temperature requirements for your specific type of pet, and make sure that the room stays within that range. A lot of people will tell you that you can use a sock stuffed with rice that is microwaved to retain heat or a hot water bottle and, while these are great ways to add limited amounts of heat, they are not recommended to be used inside the cage when you have small rodents as pets. Among all of the winter tips for small pets, there are some that can be dangerous. Rodents chew and gnaw on just about everything and can become injured or worse if they are allowed to eat some substances. Hot water bottles and rice-stuffed socks are great for transporting your pet to visit the animal hospital in Dartmouth, but not for an all the time heat source inside of their cage at home. Make sure that whatever heating source you use, you choose a method that is safe, has an automatic shut-off and that it is properly grounded. Cage heaters can also be considered, such as heating pads that are made for reptile cages. Make sure to only use the heat on half of the enclosure so your pet has the option to move if they need a lower temperature. Again, check the settings to make sure that it doesn’t get too hot and that it is self-regulating or has an auto-shutoff feature. Make sure to take special care of your small pets in the winter months to prevent injury, illness and even death. While some animals do hibernate in the wild, small rodents as pets who live with people should not. In many cases, they are unable to store enough nourishment to get them through the entire Southeastern Massachusetts winter season. If your pet goes into hibernation mode, contact your veterinarian at Anchor Animal Hospital Dartmouth right away for information on what you should do to wake them up and keep them safe.